While much about those strategies is commonly discussed among water agencies today in the US and globally, some aspects are notable. First, the report argues that reclaimed water will be needed not only for non-potable uses such as irrigation, but also for direct potable reuse for drinking water supplies. ADWR calls for starting now to address legal hurdles and public perceptions in order to ensure that direct potable reuse of reclaimed water will be available when needed, as both those actions could take some time to complete. Second, the report argues that metering and reporting of water use across the state will be crucial for developing groundwater and other hydrologic models and evaluating future conditions and potential impacts of alternative water management strategies. This push for increased data generation and collection is a departure from the attitude toward data in much of the western US, where groundwater data in particular is viewed as private and confidential. Third, ADWR dared to identify in-state water transfers as a potentially significant strategy for achieving sustainable water supplies. 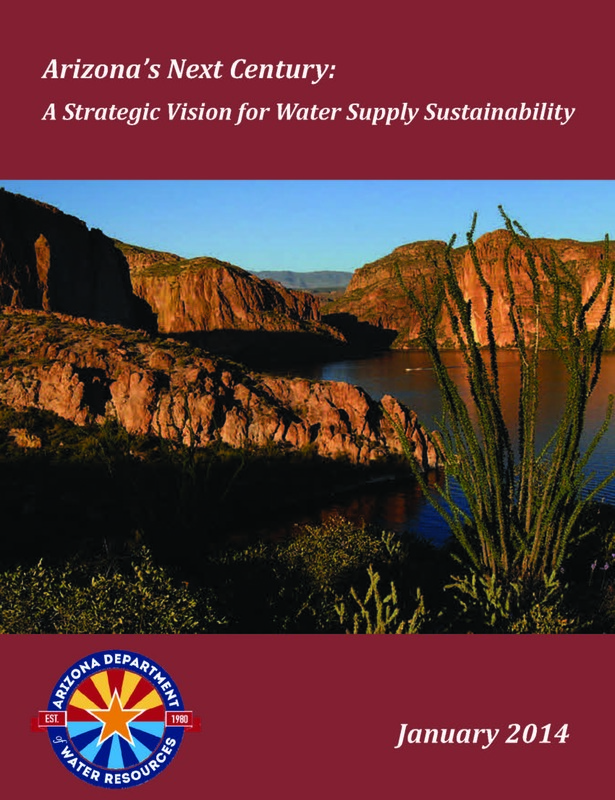 The report notes the controversy that may be involved for protection of rural areas and construction of water conveyance facilities across federal lands, but nonetheless recommends evaluation of long-term and short-term water transfers for Arizona. If the state is going to achieve the benefits of water conservation, reuse and desalination, a water market is likely to be necessary, and ADWR’s willingness to tackle the potential controversy is laudable. Fourth, the report calls for the state to begin discussions regarding seawater desalination with California and Mexico immediately. While some of the strategies are identified for action as many as ten years in the future, desalination is slated for action in Year 1. Desalination facilities could be constructed on the Sea of Cortez and delivered to Arizona either via a pipeline or through an exchange of water with Mexico or California. Lastly, ADWR notes that a state-level financing mechanism is likely to be needed to provide funding for the identified strategies. Some local areas may be able to finance their own water projects, but rural areas may need state assistance, and large-scale water projects are likely to require state financing. This is especially true in light of the probable absence of any federal funding in the future. Importantly, the report states that private capital should be evaluated as a fundamental element of the planning process. Arizona’s Next Century is an ambitious plan that does not avoid several controversial topics. It remains to be seen, of course, whether ADWR and other political, community and business leaders will follow through on the actions identified in the report. Great content, very timely; Arizona is in the news for several reasons, but water resources is the most critical issue over the long term. BTW, could you please use a darker or bolder font on this blog? That would make it easier on my old eyes. Thanks. Thanks, Steve. I have changed the font and text size, so hopefully that helps a bit!